Three teenagers in the Mekong delta province of Soc Trang were praised for their honesty after they found out and returned a wallet with money inside. One of them is Do Van Bang who is a tenth grader of Tran Van Bay Senior High School in Soc Trang. The Ministry of Education and Training proposed its sub-department to increase information of the good example of honest student Do Van Bang who returned a big sum of money to people who dropped the wallet in order to educate other students to follow the shining example. Before, on February 19, Do Van Bang and two friends, Le Thanh Moi and Le Nhi Khang, stumbled upon a wallet on street. Outof curiosity, they opened the wallet and saw much money and personal documents inside. The three decided to bring the money to the police station. Police officers contacted the owner of the wallet to return personal documents together with over VND40 million. 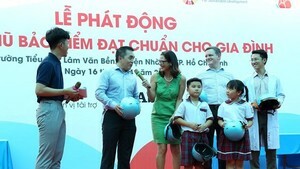 In recognition of his honesty, the Vietnamese Education Minister has signed a certificate of merit for Bang. Tran Thanh Moi and Le Nhi Khang have quitted school because of their poor families. Accordingly, the local Department of Education and Training will offer favorable condition so that they can continue schooling or vocational training. Before, Prime Minister Nguyen Xuan Phuc had sent a letter to commend the good act of the three.